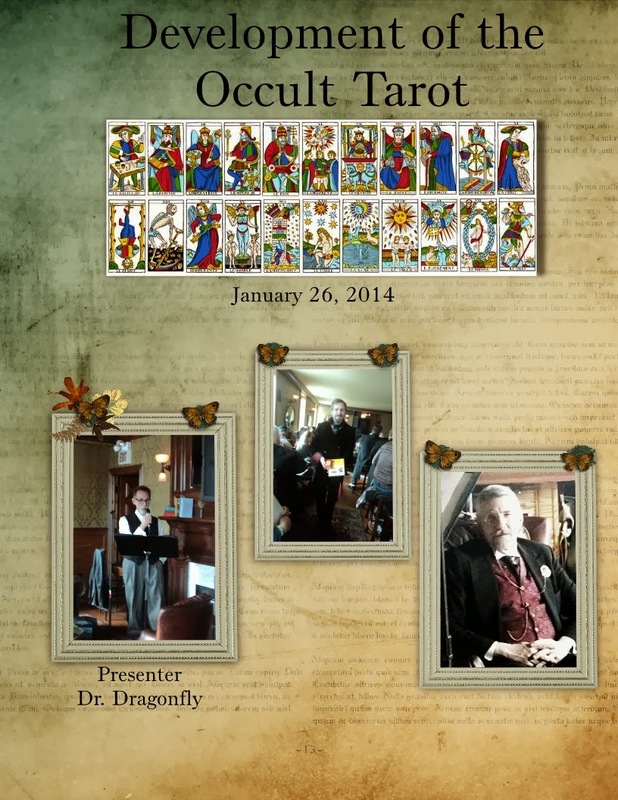 On Sunday, January 26, 2014 we heard from the mysterious Dr. Dragonfly for a thorough and historical presentation on the Development of the Occult Tarot. 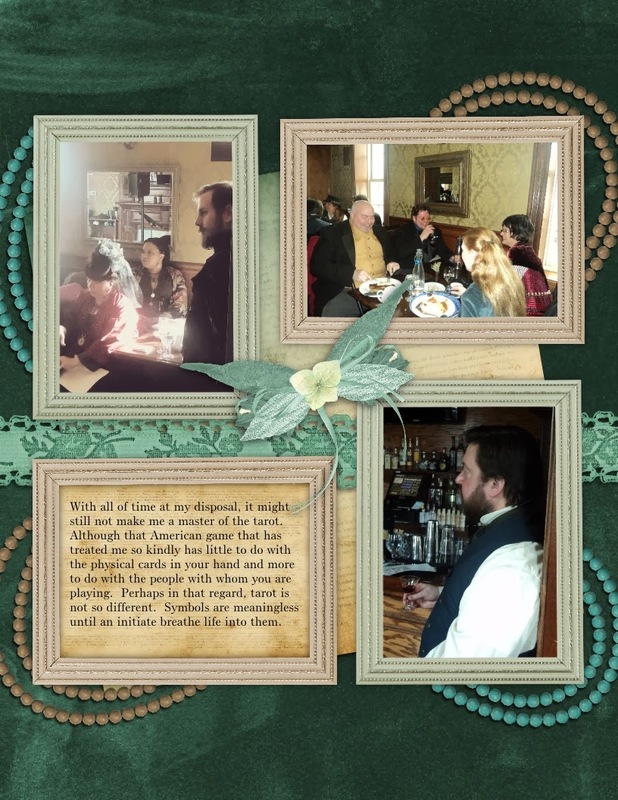 Most people would think that cards of any sort would come as second nature to me given that I’ve made the majority of my financial wealth playing cards in the saloons of the Wild West and even internationally. However, I privately confessed to the good Dr. Dragonfly that I preferred my cards without pageantry. In poker, a spade is a spade (unless you’re cheating). At the risk of Miss Dion smugly discovering this musing of mine I must admit that I find the complex symbology of the tarot rather intimidating. My intimidation might be lessen with time; rather that if my travels through time happen to land me in the late 1400’s I might do well as a professional “tarock” player as long as I have the coinage to have the cards commissioned for me. I was impressed to learn from Dr. Dragonfly that contrary to popular belief, the modern tarot deck did not come from Egypt or from the Gypsies. It was just a card game, although an elitist one because before the introduction of Gutenberg Press, cards were very expensive little works of art. The beauty of some of these decks can be viewed in fine museums. It makes one wonder where the association with the occult began. In his notes, Dr. Dragonfly mentions that in 1589 a trial in Venice associated the game of cards with witchcraft, but it is of course the 18th century that really fuses these cards with the mystic. The French occultist Eliphas Levi worked with the tarot and the Kabbalah and his work later inspired the Hermetic Order of the Golden Dawn. With all of time at my disposal, it might still not make me a master of the tarot. Although that American game that has treated me so kindly has little to do with the physical cards in your hand and more to do with the people with whom you are playing. Perhaps in that regard, tarot is not so different. Symbols are meaningless until an initiate breathe life into them. 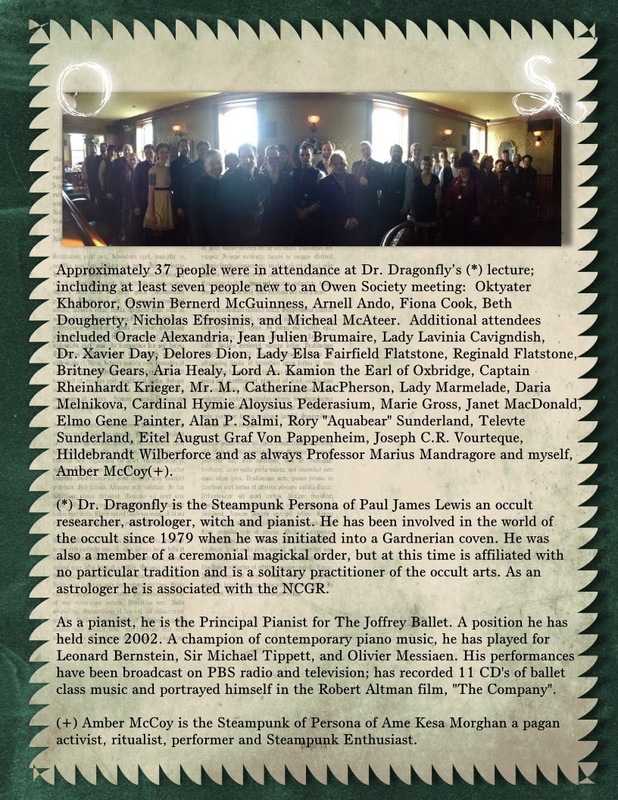 Approximately 37 people were in attendance at Dr. Dragonfly’s (*) lecture; including at least seven people new to an Owen Society meeting: Oktyater Khaboror, Oswin Bernerd McGuinness, Arnell Ando, Fiona Cook, Beth Dougherty, Nicholas Efrosinis, and Micheal McAteer. Additional attendees included Oracle Alexandria, Jean Julien Brumaire, Lady Lavinia Cavigndish, Dr. Xavier Day, Delores Dion, Lady Elsa Fairfield Flatstone, Reginald Flatstone, Britney Gears, Aria Healy, Lord A. Kamion the Earl of Oxbridge, Captain Rheinhardt Krieger, Mr. M., Catherine MacPherson, Lady Marmelade, Daria Melnikova, Cardinal Hymie Aloysius Pederasium, Marie Gross, Janet MacDonald, Elmo Gene Painter, Alan P. Salmi, Rory "Aquabear" Sunderland, Televte Sunderland, Eitel August Graf Von Pappenheim, Joseph C.R. Vourteque, Hildebrandt Wilberforce and as always Professor Marius Mandragore and myself, Amber McCoy(+). 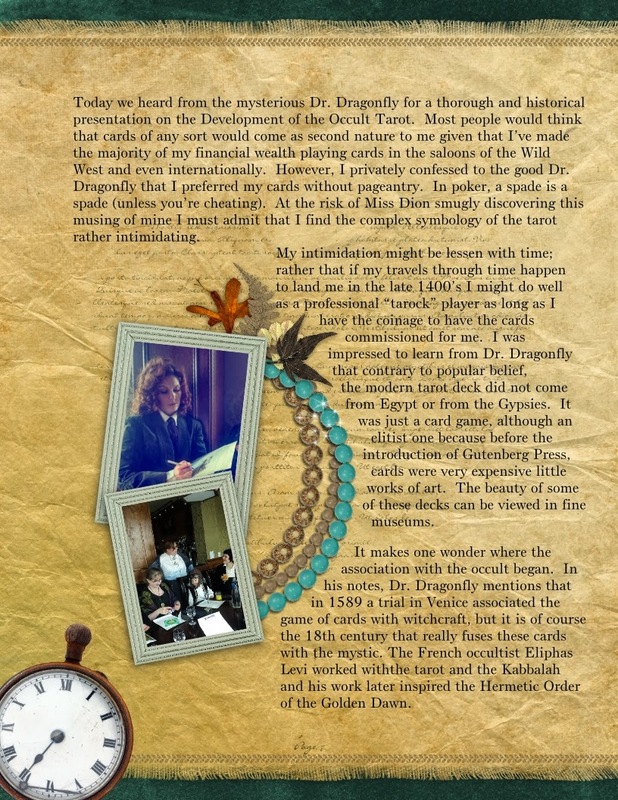 (*) Dr. Dragonfly is the Steampunk Persona of Paul James Lewis an occult researcher, astrologer, witch and pianist. He has been involved in the world of the occult since 1979 when he was initiated into a Gardnerian coven. He was also a member of a ceremonial magickal order, but at this time is affiliated with no particular tradition and is a solitary practitioner of the occult arts. As an astrologer he is associated with the NCGR. As a pianist, he is the Principal Pianist for The Joffrey Ballet. A position he has held since 2002. A champion of contemporary piano music, he has played for Leonard Bernstein, Sir Michael Tippett, and Olivier Messiaen. His performances have been broadcast on PBS radio and television; has recorded 11 CD's of ballet class music and portrayed himself in the Robert Altman film, "The Company". (+) Amber McCoy is the Steampunk of Persona of Ame Kesa Morghan a pagan activist, ritualist, performer and Steampunk Enthusiast.